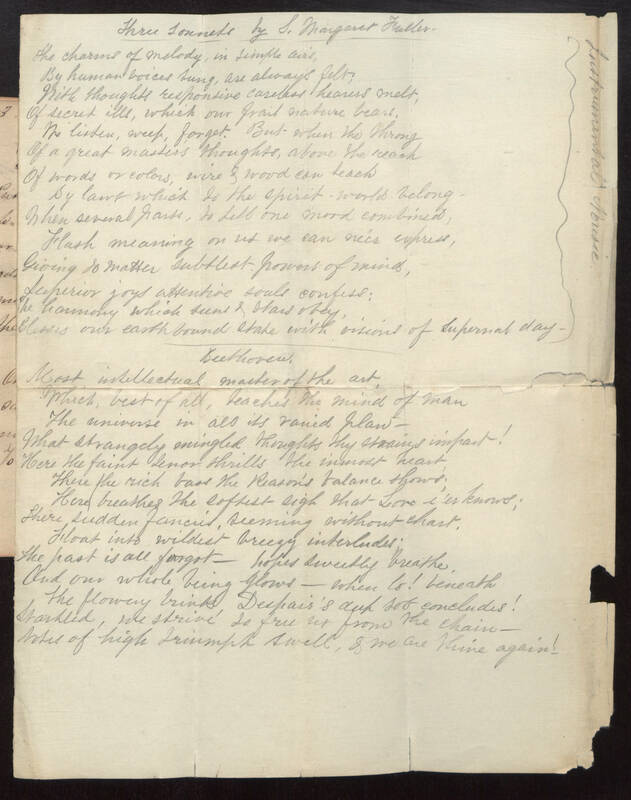 Three Sonnets by S. Margaret Fuller The charms of melody, in simple airs, By human voices sung, are always felt; With thoughts responsive careless hearers melt, Of secret ills, which our frail nature bears. We listen, weep, forget. But when the throng Of a great master's thoughts, above the reach Of words or colors, wire & wood can teach By laws which to the spirit world belong - When several parts, to Lett one mood combined, Flash meaning on us we can ne'er express, Giving to matter subtlest powers of mind, Superior joys attentive souls confess; The harmony which suns & stars obey, Blesses our earthbound state with visions of supernal day. Beethoven, Most intellectual master of the art, Which, best of all, teaches the mind of man The universe in all its varied plan -- What strangely mingled thoughts thy strains impart! Here the faint tenor thrills the inmost heart, There the rich bass the Reason's balance shows; Here breathes the softest sigh that Love e'er knows; There sudden fancies, seeming without chart, Float into wildest breezy interludes. The past is all forgot -- hopes sweetly breathe, And our whole being glows -- when lo! beneath The flowery brink Despair's deep sob concludes! Startled, we strive to free us from the chain -- Notes of high triumph swell, & we are Thine again!